Birmingham Township Municipal Offices are located at 1040 West Street Road, West Chester PA 19382; phone: 610-793-2600. Birmingham was probably named by William Brinton, one of the earliest settlers, who came from the neighborhood of the town of that name in England, and, as was common with the early settlers, selected for his wilderness home the name that would recall to his memory the early associations of his life. It was surveyed about the year 1684 to various persons, in right of purchases made in England, and was organized as a municipal district in 1686, by appointment of John Bennett as Constable. Upon the division of the county in 1789, the greater part of the original township fell into Delaware County. Each division thereafter bore the name of Birmingham twp in its respective county. Until the year 1856 the Street road was the Northern boundary of the twp of Chester co. In that year it was enlarged by the addition of a portion of the southern end of East Bradford Township. The Battle of Brandywine was fought in this twp. The site of the field of operations at Chadds Ford is in Delaware County and at Birmingham Meetinghouse in Chester County. Friends Meetinghouse and School, circa 1763, located at 1245 Birmingham Rd. During the Revolutionary War "Battle of Brandywine," the American Army took over the Meetinghouse for use as a field hospital. After the American defeat, the British used it for wounded officers. From 1795-1884 the Meeting was one of the earliest, if not the first, library in the County. Brandywine Battlefield is also a National Historic Landmark. Two weeks before the capture of Philadelphia (September 11, 1777) General Howe's 18,000 forced Washington's 11,000 men to retreat to Chester. Edward Brinton House, circa 1839. Through more than 130 years this home was owned by only 3 families: Brinton, Hoffman and Ralston. It is a 2 1/2 story stone, Georgian-style, center hall colonial. George Brinton House, circa 1820. This stone farmhouse sits atop a hill overlooking the east bank of the Brandywine. George was a direct descendant (as was Edward, above) of William Brinton, the first settler (1684) in Birmingham Township. Brinton's Mill, circa 1720, US 100 north of Chadds Ford Village. The mill played important roles in the commercial life of the area for more than 200 years. Daniel Davis House and Barn, circa 1740, Birmingham Road at Street Road. 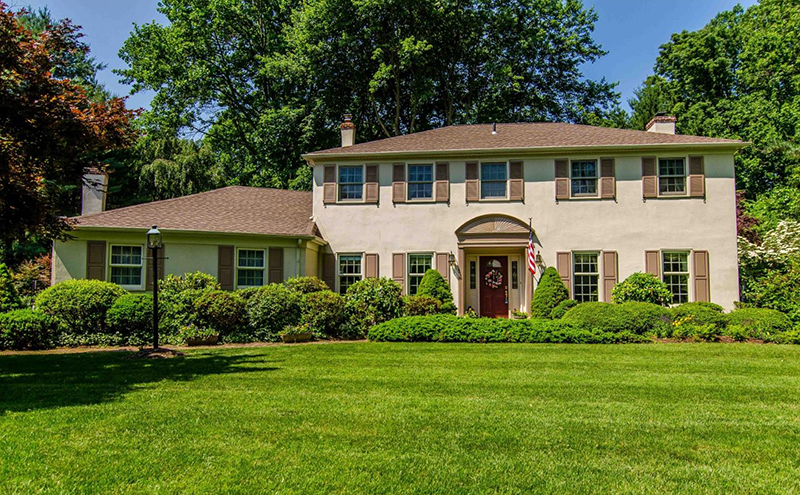 Outstanding examples of Chester County architecture using serpentine stone. Dilworthtown Historic District, circa 1758-1858. Located at an important crossroads (Brinton's Bridge Road and Birmingham Road) Dilworthtown's tavern and blacksmith shop were the focal points of this eighteenth-century community center. Edgewood, (the Charles Sharpless House), circa 1840, near the intersection of Wylie and Birmingham Roads. Gothic Victorian constructed of serpentine stone. Edgewood is one of the earliest and most ornate statements of Victorian architecture in the Brandywine area. Orthodox Meetinghouse, circa 1845. The Hicksite-Orthodox controversy (the "Great Separation) of 1827 was a major crisis in the history of the Society of Friends in America. Members rejoined with the Birmingham Meering in 1923. In 1928 the building (yet another area structure incorporating serpentine stone) was converted to a private residence. In September 2005 the township designated Birmingham Road, Brinton Bridge Road, Meetinghouse Road and Wylie Road as "Scenic Byways," a status for which criteria was established by the Pennsylvania Transportation. Birmingham Road is classifiable as scenic based solely upon its historical importance as the spine of the Battle of the Brandywine, beginning in East Bradford Township through Sconneltown and up Osborne Hill into Birmingham. This is the path the British and Hessian troops took in the early morning hours of September 11, 1777. While Washington waited at Chadds Ford for the battle to protect Philadelphia to begin, Howe took his troops up the west side of the Brandywine and then down Birmingham Road to clash at the Birmingham Meeting lands and beyond. Osborne Hill has a National Historic marker noting that it was here that the British forces rested following an eight hour march. The East side of this historic land is now partially developed, but the west side (Radley Run) still has a large farm owned by Jane Mather Sullivan. This is a treasure in historic value, beauty and a trail on the edge of the farmed land. As you reach the bottom of the hill moving north, there are the ruins of an old barn that belonged to Josephine Mather. The home still exists in the glen in the back. Gilbert Mather owned most of the Radley Run area land and ran the Brandywine Fox Hunt from Chadds Ford to Embreeville. On the eastern side of the road is the green stone home now owned by Mr. And Mrs. Samuel Walker. A monument marks this site as the home of Issac Sharpless, circa 1845. Going up the hill to the west, sandwiched between the various Radley Runs, is the Benjamin Sharpless house which was said to have served as part of the Underground Railroad. Continuing southward is Radley Run Open Space and on the east side is an estate once owned by Joseph Murtague, who was an influential member of the West Chester Fox Hunt for many years. Murtague's estate was the 1740 Daniel Davis farm and still contains an attractive old barn, lovely stone house and open land. Crossing Route 926, on the east is Linden Farm of 1732 which is adjacent to Birmingham Meeting House. It was here that opposing muskets were fired in the Brandywine Battle when the Colonists made a wavering line of defense from the Meeting House stone wall across into Skirmish Hill which is now part of the O'Dell's property. The outstanding historical significance of the Meeting House is reviewed in the Meetinghouse section. The Meeting House itself was used as a hospital to treat wounded from both sides. Largely a Quaker community, Birmingham Township had mixed feelings concerning the battle, but great compassion for the injured. There is a mounting block preserved outside the Meeting House from which riders could mount their steeds. A trifle south and west on Birmingham road is the Orthodox Quaker Meeting and cemetery of 1854. The O'Dell's meadow is a lovely scenic vista and in the spring is full of wild blue hyacinths, which might be the curse of the farmer, but a "stop and awe" place for residents and visitors. On the corner of Birmingham and Wylie Roads is a cannon once introduced by an historic plaque dedicated to the Battle of the Brandywine, but lost many years ago. The cannon was placed in 1895 by Pennsylvania citizens at this site, the same time as the Lafayette Monument, to memorialize the largest contingent of soldiers fighting in the largest land battle of the Revolutionary War. The cannon is a US Naval Civil War armament, but nevertheless marks an important part of history. A second cannon of the same type and period marks a place about a 1/4 mile further up the road in Sandy Hollow Heritage Park. Across the road from the cannon is the Seal home, which was originally a post office and small store and handed down from generation to generation. Phoebe Sheffield Wylie's grandmother was a member of the Seal family. This land is in Conservation Easement. The cannon and adjacent land is owned by Mr. and Mrs. Thomas Marshall whose family once owned the large home beyond the iron fence. It is a treasure of early Victorian architecture built by Charles Sharpless in 1845. Tom Marshall's land on the corner is in Conservation Easement and has a walking path off Wylie road. Across the road and up a bit further is the mid-nineteenth century home of Dr. and Mrs. Scott Garrison who own the property that adjoins the Lafayette monument. This is adjacent to Sandy Hollow Heritage Park. Across the road is a wooded area with houses hidden in the woods. The Fieldpoint housing development across from Sandy Hollow (on the west side) was the Bennett Beatty farm for many years. Much of the battle spread across this area. Washington, Lafayette, and, Pulaski, the leader of the cavalry charge, came up from Chadds Ford through this vicinity to join in the closing rounds of the Battle of the Brandywine. The Knolls housing development now across the street was then a wooded area with small farm lots on the north side. The Dilworthtown Presbyterian Church, built in 1878, is on the south side. Birmingham Road continues to Dilworthtown with a functioning Inn operating since 1758 and the Country Store of 1775 which, as mentioned earlier, served as a hospital for the wounded and a holding cell for Continental prisoners taken by the British during the Battle of the Brandywine. Birmingham Road is a "virtual road of history" inclusive of the Quaker's culture of peace versus the Battle of the Brandywine. Homes along the road are a marvel of Victorian architecture and the local Serpentine stone from the quarries off New Street. There are scenic vistas to be found and trails to be walked and ridden along Birmingham Road. Meetinghouse Road qualifies as a scenic road due to its open land and rural bucolic setting. Much of the land is in Conservation Easement and the limited volume of traffic and the ability to walk along the edges of many meadows makes this a "jewel within the township and Chester County." The road is named for its eastern terminus which is the Birmingham Meeting House, an eighteenth century Quaker meeting that existed at the time of the Battle of the Brandywine. The original meeting house was built in 1763. The Birmingham Friends Octagonal School House, built in 1819, is an historical landmark of remarkable construction. In fact, much of the upper portion of the Meetinghouse Road is within the bounds of the National Historic Landmark designation. Beginning at the eastern corner of Meetinghouse Road is the 1720 William Seal house and barn. This land, plus the land across the road, was the scene of much of the first line of defense between the English and Colonists during the Battle of the Brandywine on September 11, 1777. The road goes through gently rolling farmland owned on the south side by Mrs. David Dallas O'Dell and on the north side by Mr. and Mrs. William Worth. This is a lovely stone house with an accompanying barn. There is a spring fed pond which flows into a branch of Renwick Run. The Worth's "Wind O Hill Farm" is in Conservation Easement and has mowed walking trails for public use. The north side of Wind O' Hill farm is wooded with large trees and some rare flowers hidden in the leaves during the spring. The Worth farm is adjacent to Brigham's land, also in conservation easement. The house to the west of this is the former home of Mr. and Mrs. Brigham and is quite old. Peggy Brigham is the granddaughter of President Herbert H. Hoover. A housing development has now been placed on the northern side of this home, but the stream and landmark sycamore tree is still visible. The former Renwick property on the corner of Meetinghouse and Creek road was once the Frank Graff Farmsted of 1800. This is a beautiful stone home with barn, a small portion of land and runs a few horses. On the other side is the former home of Ted Brinton, whose forefathers named and owned much of the township through a grant from William Penn. At the end of Meetinghouse road is the flood plain for the Brandywine River. This is where the Lenni Lenape Indians wandered and later was the first home of Lenape Amusement Park. A small swing bridge crossed the river. At the eastern entrance of Wylie Road lays the Cannon marking the Battle of the Brandywine and at the crest is the Seal Store and Post Office of 1830. As you travel from east to west, there is Marshall Conservation Easement on the left with the old square Charles Sharpless house of 1845 adjacent to this easement. On the right is the still glorious open space of the O'Dell farm which is where the second line of defense for the Battle of the Brandywine took place. The original postal road can be seen in the meadow which led to the still existing road by Peter Shea's. The "postal road" once led to Brinton's Bridge Road and was used by horses through the 1950's when the primary home was the Darlington-Biddle Farm of 1812. Prior to reaching this corner is the original Firethorne Farm house and barns of 1840. The home and barn immediately to the west of this farm and the next one were tenant homes to the Biddle estate. The barn on the corner is a remarkable construction in which the barn is propped with huge pillars and has a ground rise to the hay barn. Continuing west on Wylie Road there is a wooded area on both sides of the road prior to the Legacy development. This hill was one of the marvels of our area for one could see from Chadds Ford to Pocopson from this point. The circa 1820 home on the north side has been renovated and enlarged several times, but once housed the farm help for the Wylie farm which contained most of the property on both sides of the road from this point to Creek Road. An easement ran from Wylie Road to what is now Cannon Hill. This was once owned by Bayard Taylor in 1788. Sylvia Walker bought 50 acres in 1944 to create a farm distinct from the farm of John Wylie who tended many acres with his sons, John, Bob and Bill for many years. Part of the Wylie home, on the north corner, is the subject of a painting of N.C. Wyeth named "The Milkhouse." The old barn had a cooling shed and across the road from the main house are a few stones that marked the "pick up" for the milk cans. There are several old sheds still here. One was the "sales" house for a nursery prior to the Wylie purchase and the other now on the crest of the drive may be an old smoke house. This was all part of what is called the Darlington, Biddle, Wylie farm dating to 1812. Now owned by the Magness family this is preserved in the property deed. Moving further down Wylie Road, there is a flood plain to the right and the MacIver woods on the left. The MacIver land runs from the Magness line to the residence at the end of that woods. This is in Conservation easement. It is said that Washington's troops moved up through this woods in their attempt to cut off the British. In all probability, they moved from Brinton's Ford up Brinton's Bridge Road and Wylie Road. Wylie road is scenic, historic and still preserves the winding character of a rural road. It connects the National Historic area with the Brandywine River Valley which was the home of the Lenni-Lenape Indians. As with Meetinghouse Road, Wylie Road undeniably qualifies as a "Scenic Byway" under Pennsylvania law. Beginning at historic Dilworthtown, Brinton's Bridge Road connects the village with the Brandywine River Valley and a view of Andrew Wyeth's studio and old mill which is still operational. Dilworthtown contains the old store which fell into the hands of British troops during the Battle of the Brandywine on September 11, 1777. Following the retreat of Continental troops, the British used this building as a hospital and a lock up for prisoners of war. In addition to the store, there is a very old building on the corner which is the Arden Forge, 1820. Moving west on Brinton's Bridge Road, there is a marker placed by the Chester County Historical Society noting that this home was the birthplace in 1788 of Dr.William Darlington, a renowned botanist. There is a spring fed stream below this which runs into Brinton's Run, and beyond is a home once owned by Edith Hatton and has outbuildings dated circa 1825. The drive, recently paved, was the old Postal Road which once connected Brinton's Bridge Road to Wylie Road. This road can still be seen as a depression on the O'Dell meadow revealing the diagonal path connecting to Birmingham Road. The Serpentine stone home across the road from it was the Edward Brinton home of 1788. To the north side are a number of homes which was once part of the Brinton Johnson farm built in 1840 and owned by Robert MacIver in the early 1900's when Brinton's Road still had a dirt surface. This is adjacent to Albert Webber's home, part of Brandywine Farm of 1788. The ruins of what is reported as the largest barn in the area can still be viewed from the road. There is a milk cooling house on his property and one across the road where there was once an open spring. On the southern side of the road is the land owned, until recently, by Mr. Jones. This is a large tract extending from Creek Road up to the field at the top of the hill. This land is in Conservation Easement with a restricted number of homes permitted. This wooded area is the home of pileated woodpecker birds. At the end of the road, where it connects with Creek Road, is a view of Wyeth's property and on the north side is the Gilpin's school house of 1803 renovated by the Wyeths and used as a studio by Mrs. Wyeth. Brinton's Bridge Road, as with Wylie, Meetinghouse and Birmingham Roads, contains all of the elements of a Pennsylvania Scenic Byway.